I've made so many cute cards i don't know which one's to post on here. These are both made with Piece of cake which is tons of seperate pieces and then you build them up. Like the Have your cake is 4 different stamps - The Cake and Eat one stamp and Have your and it too is another one and then frosting and filling are 2 stamps too. I used chalk inks on these. I love these Elzybells stamps with of course link being on the side over there. I bought almost all of them. This one turned out so cute. I sewed along the edges with my little sewing machine. I used my Copic Spica pens and went along the border of the cloud and other areas so it sparkles a little bit. Also took ribbon and hung a little snowflake charm on it. Then added the little saying at the bottom which is also hers. I run out of ideas though and can't think of anything new to do. Hopefully I can come up with things for the other one's so you can see them. Well as you can see by ebay i was busy today and made a bunch of cards. I thought i would share this one with you i love how it turned out. Stamp set is called "Believe" by PapertreyInk which is on my links. I colored the tree in pencils and then i took my Copic markers and shaded each leaf. I added red markers for the berries and then used my Copic Spicas and sparked each one. Then i used my Clear Lacquer and added a dot to each one to raise it. Santa is colored in pencils except for his face i used markers. Then i did the same with the wreath as i did for the tree. I added a metal bracket which is from stampin up but they sell similiar at Joanns. Also can't forget i took a fuzzy pompom for the hat and ribbon for the wreath. Glitter Cardstock is from Joann's Glitter Cardstock Stack. I think my story is everyone's these days but as you can see by my little ticker on the side i have been trying to lose weight forever. I quit smoking 4 years ago and gained an instant 40lbs from my 120lbs and its been a constant battle since. I think I have tried every product on the market today from powers - liquids - shakes you name it. Few of those brands would be Metabalife - Trimspa - Dexatrim - Slimfast only to name a few. I was at work a couple weeks researching weightloss. I know it gets harder after 40 but it shouldn't be impossible. My problem is not the amount of food i eat at a sitting but that i munch munch munch all the time. I think everytime i go into the kitchen i grab a handful of something to eat. So ok back to the research. Anyways i ran into something called Hoodia - its all natural and grows in South Africa which its a plant. They are trying to make synthetic one's here in the states so you got to be careful. Must say 100% pure on it. I have only found a couple distributors of it that were legit. Which are HoodiThin and DesertBurn there are a couple more too but i was more interested in liquid as its immediately absorbed unlike pills that take forever to kick in. I am too cheap so after doing my research i bought a couple bottles of HoodiThin on ebay. I think i paid $26 for one and $30 for the other. It was used in Africa while they were on hunting trips they ate it because it filled them up without eating or bringing along a bunch of food. Now i am thinking but does it work. I have wasted so much money on these products whats another right. So when it came last monday i believe it was it suggests 1 full dropper a meal but then your little bottle wouldn't last long. I put in 1/4 dropper and use it 4 x a day when i am hungry or feel like munching. Guess what no food cravings and i am full all the time. You have to make yourself eat because obviously not eating isn't healthy. But since last money i have dropped about 5lbs which everyone knows first week you lose more than others but keep track of my tracker and you can see how much i lose. I don't feel any side effects like i do with other weight loss products - No headaches - sick to my stomache - shakes - tremors or anything else. First couple of nights i did have some horrible dreams but that might have just been that day's stress. But if there is someone out there like me its worth a try. My husband is also doing it i don't know if its because of weight or what but he needs the full dropper where as i get by with the 1/4. Oh also I am switching to the Desert burn when i am done with this bottle because its double the size of the bottle of hoodithin and it is double the Milligrams so 250mg per serving vs 500mg of Desert Juice and its a 2oz bottle whereas Hoodithin is only 1oz. I can't tell you yet on its effects but its 100% though i haven't see it for sale on ebay i bought the 3 bottles of their website for like $130 and there is $10 off till Nov sometime if you enter Fall777 for the 3 bottles. It came withint just a couple days also. 2 more days of work left for me this week and then i will post some new cards. Have a great week. Wow where does the week go? My weekend ends in about 20 minutes and then I have to go to work. Thought i would post another Thomas Kinkade card i made this evening. These cards take a long time to make because of all the coloring that is on them. I think they look nice in just one color too but this one i colored pieces of it. Colored in pencils and gamsol and then added some glitter. I am driving up to my parents house tomorrow morning to spend the day with them as its their 50th Anniversary. They are about 3 hours one way from me. I thought I would take them out for dinner. I was trying to think of a card for them which i tried making several and hated all of them. Finally i came across this stamp i bought from Impression Obsession - I embossed it in gold and then took Twinkling H20's and colored it. I used my quickutz to cut out Mom and Dad and then Happy 50th Anniversary on the inside. It's gorgeous in person.... Hope everyone has a great weekend. I apologize i haven't had much to post lately. I go in slumps where i burn myself out and don't feel like making anything. I am kinda in one of those right now. So i will be making mainly Christmas cards. Ok here is some stamps i got the other day I just love them but wow the one i colored - tons of work took me a long time. Not sure how many of those i will do. I colored the first one in prismacolored penciles and gamsol. Then for the lights i used Copica Spica markers that are kinda shimmery. 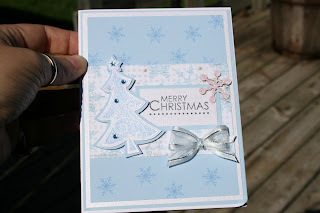 Next card is done in just blue bayou Stampin up ink on plain white cardstock and then i added glitter to both. I love how they turned out though. Wow i have been so busy it seems with kids stuff and work and everything else I haven't had time to make any cards this week. So i sat down today and made a few. These are the newest stamps by Art Gone Wild arn't they great. I just love their little mice. Nothing special done to them they were colored with Copic markers and i made parts of them 3d - Added some liquid applique to the pie one to make the frosting look real. I am hoping to get some more cards made tonight. I haven't posted anything on my days off so I thought I would post something I just finished. I just received my Impression Obsession order. I was hoping to post a coffee card tonight but my order got messed up and i didn't get the one set of coffee stamps so hopefully i will have those next week. This set is gorgeous too though, its called Wreaths & Garland . It's a clear set with a bunch of little one's. I have never been a big acrylic person but once i figured out how to get them started now i don't mind them. Everytime I use to stamp with them the ink got pulled off and they never made a clear solid image. But Nicole at Papertrey said to take a white eraser on them and dang it works great. Now i don't have any problems, well except my fingers getting full of ink putting them on and off the acrylic blocks LOL. This one anyways I did in Curious Metallics Ice Gold shimmery Cardstock. I used 3 of the different leafs in the set and the flower and the pinecone. I love how it turned out, at first i wasn't sure of it but its gorgeous. I made the flowers 3d and added a rhinestone to each and some ribbon i bought at Michaels tonight. Isn't this great I made this today. Unfortunately its gonna make me gain weight eating these as I ate 1 to every 4 i wrapped LOL. 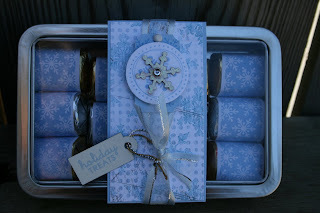 I stamped each chocolate and then decorated a band for the tin. I made a card to match. I stamped on Shimmery Stardream cardstock. I added some ribbon i got at michaels and then some chipboard snowflakes i cut out using my cuttlebug. I used some Rhinestones i got at Archivers... This turned out so cute i wish my pictures would have turned out better. Gotta love presents. Of course i am working and havent done any stamping on those days until my days off. I am way too wiped and no energy. But today hubby gave me to bracelets for an early anniversary present. We have been married 9 years in October. 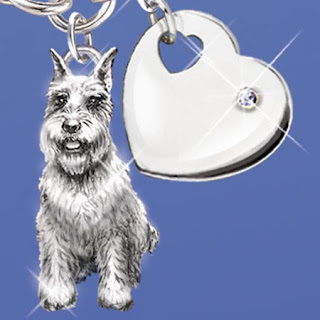 My little schnauzer is my baby she sleeps with me and is my shadow. So he trys to buy me stuff with her on it. I got 2 bracelets one is an italian charm bracelets its gorgeous and the other one is a silver bracelet with her being the charm. I put pictures up. 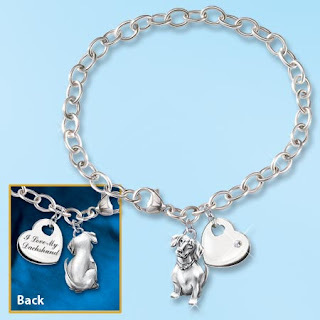 The charm bracelet has another dog on it in the picture but see the seperate picture with the charm. Very cute. House mouse stamp one of their new one's i can't remember the name though. 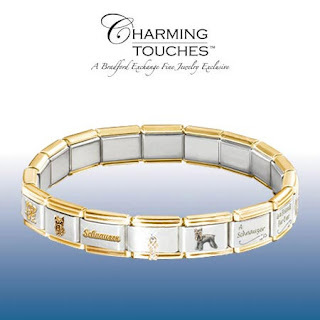 HM stamps has it on his site. By the way his prices are ALWAYS 20% below retail so buy your house mouse stamps from him. Its a retired guy and he's great. This one was hard to 3d so i just made the bags 3d and colored the rest with pencil. I wasn't too ambitious today. My husband stayed home from work so he dragged me to Best Buy but i got a new Divx DVD player out of the deal as an early anniversary present so i cant' complain. Then my son was suppose to go to his dad's tonight which i drive 1 1/2 hour one way to meet half way but he never called so i've been kinda lazing it all day. Oh yeh then i got my Joann's order which included 3 inch Cropper Hopper embellishment drawers and ribbon holders and clips. I watched Day's of our Lives and put all my loose ribbon on the holders.. I gotta order some more not near enough. Ok i best get back to my cards. Almost forgot i was gonna show these notecards i made yesterday. I still don't have the hang of watercoloring and to me its faster to color with pencils but they turned out ok i think... I need some more of these stamps so i can do some more i only have a couple. They are by Rosies Roadshow I love em.. Here is a card i just finished making isn't it cute. Its a penny black stamp and i colored with pencils on kraft paper... I just love the paper i have some in pink also. I cut the head out and made that 3d along with the bowl... very cute i think for a guy's birthday. Well its Monday night its my last night for this week as I took tomorrow night off. I got a nice surprice in the mail today and got a bunch of embossing dies that look like my scallop punches but in all shapes and sizes and they are embossed along the edge. I used one in this card I am going to show you but its hard to see in pictures. This card i made because i had this paper left over from another card and now i am all out of it. I like it looks like its knitted. I stamped a fluffles on that paper and used the sweater and yarn ball to cut out to match the background. Well i started back to work last night so my energy level is like zero. I worked on 2 cards this evening. This is one of them. Puppy is so cute. I colored him with pencils and used my cuttlebug to do the background with one of the Christmas embossing folders. I used the other one and did the snowflake circle behind the puppy. I added some chipboard snowflakes and put some glitter on them so they would sparkle which were also cut out of my cuttlebug. Ok last night I made a few cards but i absolutely love this little puppy. 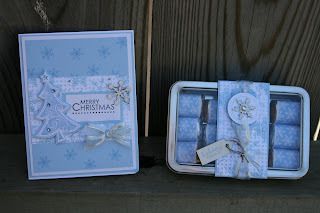 I stamped him on craft paper and then I had a little tiny snowflake which i stamped in white on the background. I bought some sparkly markers from Ellen (Link on front page) which i love so the nose and headband and ribbon are sparkly. I just got these markers maybe a month ago and i already used all my white. Which is clear and you can put over any color. The Happy Holiday which are metal are from Oriental Trading. I don't remember how much they were but everything at that place to me is fairly cheap. Added 3 layers of cardstock and paper. The paper which is coated is from Darcies i forgot i bought it LOL... Everything is colored with colored pencils except the copic sparkly markers. Someone commented and asked me how many stamps i own LOL.... Hmm i never really thought about it but i am starting to Unmount my Stampin up sets and have already went through 300 CD cases and i have maybe 200 left?? I have hundreds of different companies which Penny Black being one of my favorite and Stampendous. I have 100+ house mouse cause i just counted them recently. And tons of others... I never sat and figured it out cause i would get scared thinking how much money i have spent in stamps. I should probably sit down one of these days and go through my stamps and add more insurance on the house just in case. Ok had to post this card cause i just love how it turned out. I just ordered a bunch of new stamps and some of them came today. I started with a white background and then used the Happy Birthday Banner on the top. Then i stamped some grass on the bottom and the little bees. I colored the buzzard in pencils and markers and put him on top with a couple balloons. The saying I bought with the stamp... Very cute. I thought would be a great card to give to a guy. I got these little stamps the other day. I truely love them they are so cute. A bunch of little elves named Pixel and Pookie... Nothing special about these cards outside the fact they are adorable. Both cards I am using the new paper by K & Company that came in a stack. I had to post another post today to show these adorable cards i did. I used a sheet of transparency and then stamped on them. The snowflake one has white snowflakes stamped on it and then the halloween one has bats. I let them dry because they smear easy if you don't let them have a good drying. The snowflake one i stamped in Hybrid Pallette Canvas and the Bats in Black Stazon which drys a little faster. I think made a normal card underneath with 3 additional layers. Anyways Again have a great weekend.